Evening all! @JimMcCauley here again for another week; normal @kleptones service should be resumed next Sunday. It's a hectic day for me, bashing out a bunch of articles about mechanical keyboards (the glamorous life of the freelance writer, eh) that I need to get done before we head off for a few days at a very nice B&B in Snowdonia. 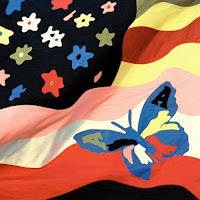 Last week saw @emmaprice at the controls with her pick, The Avalanches' extraordinarily long-awaited Wildflower. Was it worth the wait? The general consensus was, yeah, kind of; it might lack the impact of Since I Left You (which of course was Emma's very first Listening Club pick), but its laid-back summery vibe's hard to resist and it's a definite grower. So thanks to Emma for the pick, and for ably aiming the frisbee at @CakeHugga, who will address you now. "Hello Listening Clubbers! Hope all is good with you this week. I’ve been enjoying my summer holidays and coping with the chaos caused by having building work done. Also, I’ve suddenly developed an interest in sports with the wall to wall coverage of the Olympics. "All my previous Listening Club picks have been old favourites – albums I already knew and loved and wanted to share. I’ve gone for a new approach this week. I started looking for some new music and stumbled across a recommendation for the album I’ve chosen. The style of music reminds me of my teenage listening choices but it is a brand new album, released this year. "I guess that as well as starting a new chapter of my life having got married 3 weeks ago, I’m starting to be able to look forward to new experiences and new discoveries. It’s a nervous but also very exciting time in my life. "Anyway, this album caught my attention and I look forward to giving it a proper listen with the rest of you on Sunday. It reminds me of a lot of other bands I love. I hope you enjoy." Awesome! Direct download is here, and all things being equal the HearThis stream should be below.